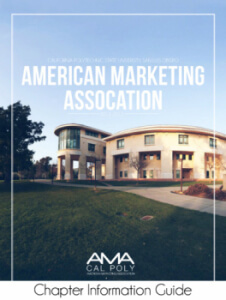 Established in 1978, the Cal Poly, San Luis Obispo chapter of the American Marketing Association connects students to their peers, professors, community, and industry professionals. As an internationally recognized organization, the American Marketing Association aims to provide students interested in the fields of marketing and sales with the tools and tips needed to create a successful career and future. As one of Cal Poly’s largest and oldest professional business clubs, Cal Poly AMA prides itself on its ability to bring top level companies and businesses to our campus as well as providing insight into the vast depth of career opportunities related to marketing. To learn more, download our chapter information guide! Improving – Advancing marketing competencies, practice and thought leadership. Promoting – Being an advocate for marketing and promoting its importance, efficacy and ethics. Supporting – Being an essential resource for marketing information, education/training and relationships.